Russia claimed victory at the second heat of the 2014 Tank Biathlon world championship, the Russian Defense Ministry’s press service said Wednesday. “On the current stage [of the competition] Russian Federation came first [with the result of] 26 minutes 27 seconds, the Republic of Kazakhstan came second [with the result of] 30 minutes 14 seconds and the Republic of India was the third [with the result of] 31 minutes 26 seconds,“ said the chief judge of the competition, Lt. Gen. Yury Petrov was quoted by the press service as saying. 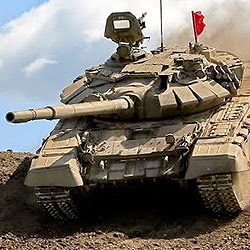 The People's Liberation Type 96A main battle tank ranked number eight during the first round of the 2014 World Tank Biathlon individual race, which took place at a landfill in Alabino, near Moscow. Petrov added that the final results of the individual race would be announced after the third heat on Wednesday. According to Petrov, the main draw of Wednesday’s race is the competition between the Russian crew led by Sgt. Bulat Tsyrenov competing with the T-72 tank and the Chinese crew with their Type 96A tank. Tank biathlon is a mechanized military sport invented in Russia. It is designed to be very similar to the regular biathlon. Competing teams need to overcome several obstacles like a slalom section, a ford, a steep hill, a panel bridge and an escarpment and hit targets simulating tanks and low-flying helicopters. The current competition, which began on August 4, takes place in Alabino just outside Moscow.